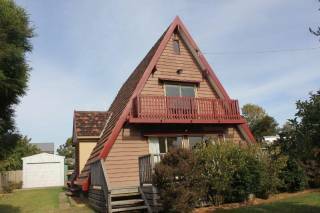 Looking for a unique property for your stay in Cowes, Phillip Island? This stunning 4 bedroom, 2 bathroom home with indoor heated pool sleeping up to 10 is ready to welcome and entertain you. Plenty of space for larger family groups looking at getting away together and superb for a couples romantic weekend. Linen and towels are supplied. The impressive entry complete with porcelain tiles that run through the formal living area joins the hardwood floor giving you that feeling of opulence. Cook up a storm in the open plan kitchen with solid granite benches, stainless steel appliances, coffee machine and a formal dining area overlooking the amazing indoor heated pool. The pool area is surrounded by a generous outdoor deck with marble top dining setting and umbrella designed for a relaxing BBQ with friends or even an afternoon mocktail/cocktail in the sunshine. Kick back and recline in your very own home theatre room with a library of movies, Apple TV and Netflix to choose from. Free Wi-Fi and fixed line internet available for you; there is a 48” Smart LED TV in the lounge room. This premium property is for the discerning traveller only. We do not accept large party groups. 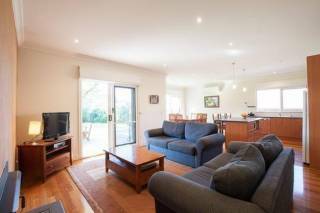 Fully equipped kitchen with modern appliances, electric stove and gas oven, microwave, dishwasher, dishes & utensils, Espressotoria Vittoria coffee machine, toaster, kettle. Split system air-conditioning & heating in dining/living area and home theatre room. Bathtub, hairdryer. Heated towel rail in ensuite. Washing machine, ironing facilities. Home theatre with a 3 seater recliner and 2 single arm chair recliners. 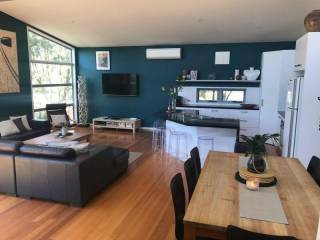 48inch Smart LED TV, Apple TV, Netflix, DVD & In house movies, free Wi-Fi, Indoor heated swimming pool, outdoor dining area, BBQ, double car garage and on street parking available. Thanks to energy straight from the sun we have an environmental conscience facility with an economic outcome — a win-win for you and the planet. This is a solar heated pool with a gas overlay to ensure that even on cloudy days and all year round it still maintains an even temperature. Bathroom 1 – Free standing bath, Shower with detachable head, bidet and toilet.